It goes without saying the gap between the fake exploration on Star Trek and the actual exploration at NASA is huge. But next year, they’ll be worth exactly the same at the post office. 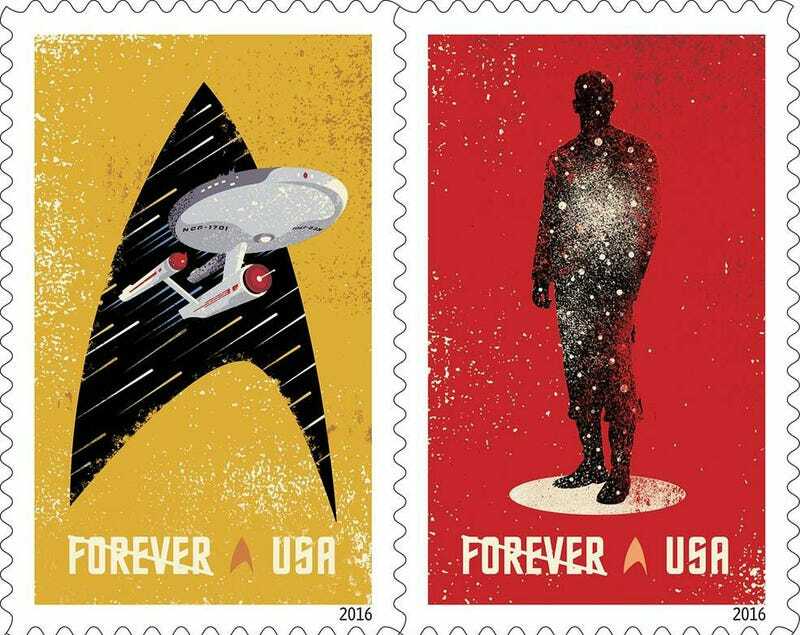 The United States Postal Service has revealed some of their new 2016 stamps and there are four commemorating Star Trek, which will be celebrating its 50th anniversary, as well as NASA’s Planetary Science program. Here are the Trek ones. There a bit more to the the NASA stamps though. First, there are the New Horizons Pluto stamps. In 1991, a stamp that said “Pluto - Not Yet Explored” was placed on the spacecraft as it set out towards the planet. It finally arrived earlier this year, so NASA and the USPS decided to do something special and reissue it with a few twists. The image of Pluto on the stamps is composted from actual photos taken by NASA which is also the case with these - more traditional but just as beautiful - planet stamps. Finally, not to be get left out, there are also these Moon stamps.